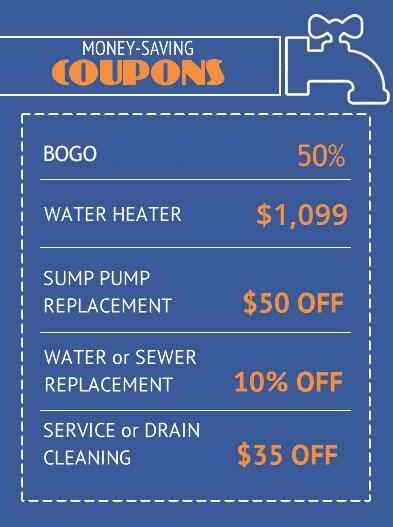 Need an estimate for sewer replacement? Click Here. When a clogged drain first occurs, you may just reach for a plunger. And, for minor clogs this is sometimes a good remedy. But, if the clog is reoccurring, widespread, or you suspect it may be a symptom of a more complicated issue, reaching for the plunger (or harsh chemicals) may not be the best solution. In Maryland, many older homes have aging plumbing systems so let Abbott’s Plumbing inspect and quickly diagnose where your problem is located using state-of-the-art fiber-optic cameras. Through the use of the cameras, we’re able to fix the problem faster and at a lower cost. 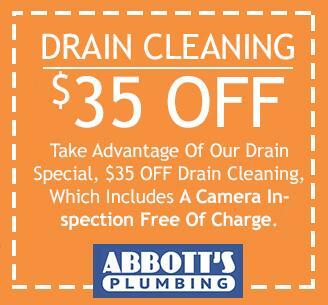 Take advantage of our special, Drain Cleaning $35 OFF, which includes a camera inspection free of charge. Regardless of age, plumbing systems can develop clogs as build-ups occur over time. Commonly, pipes will build up with years of debris from rust and hair or grease and corrosion from chemicals. Clogs in your drain system can often be hard to pinpoint. Even though you may be able to unclog it yourself, the professional-grade equipment we use ensures the drain stays clear longer and any underlying issues are uncovered. Greases, soaps, fats and detergents build up over time on the inner walls of the pipes and eventually cause them to become clogged. Our licensed plumbers will use a professional sink machine to cut through the clog and get your drain flowing again. Bathtub and shower drains usually clog with hair and bathroom sink drains can clog from many different things; hair, toothpaste, and soap to name a few.. We use drain cleaning machines specially designed for bathroom drains to open the drain, removing hair and build-up from inside the pipe. Toilets most often clog with items not meant to be flushed (wet wipes, toys, etc…), or sometimes just too much toilet paper. Our plumbers can clear your toilet and get it back to working order quickly, minimizing the costs others may have. Main drains & sewer lines can become damaged by simple aging, breaks, roots or bellies in the pipes. 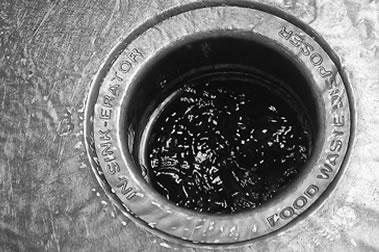 This can cause widespread issues as many drains will become slow to drain or worse, backup with waste coming into your home. Abbott’s Plumbing can diagnose repairable problems in your main drain and sewer lines before the situation gets out of hand. We offer complete rooter services including video camera inspection, traditional sewer repair and replacement, trenchless solutions and more. Rain leaders, area way drains, and floor drains are often French drains. Abbott’s licensed plumbers can quickly determine if they are simply clogged or draining to a saturated drain field. Often we can find a permanent solution to fix the issue. The longer you put off calling a drain cleaning professional, the more opportunity an emergency situation can occur. Our licensed plumbers can expertly diagnose, locate and fix any clogged drain inside or outside your home. We carry professional-grade specialty equipment to address all types of clogged drains. This enables us to locate and fix the problem quicker and more efficiently than any other solution. We take pride in our ability to respond quickly and on-time for your drain cleaning, clogs or back-ups. We have plumbers in your neighborhood, call or contact us online today.